I have spoken before about the horrifying experience that is the Star Wars Holiday Special. This was aired ONCE in 1978 and Lucas has tried his hardest ever since to pretend it never happened. I would try to as well, but it just might not happen that way. Mostly because I keep showing it to people so they can hold Star Wars in a new light and stop whining about how bad the prequels were (they are not as good as the Original Trilogy, but I dont hate them) and once they are forced to sit through this gem, everything else just looks like a masterpiece. I brought up this topic earlier this month in time for its 30th Anniversary Celebration which also marks the first time a Lucasfilm employee admitted it existed and kept his job. 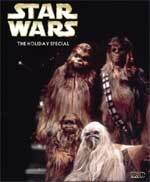 However, while surfing around today I discovered that someone had the patience and endurance to upload the whole damned thing to google video, so for those of you who wanted to see it for what it is… I give you the Star Wars Holiday Special! This copy even has the original commercials that aired with the show, so there is a little bit of nostalgia when ads for Alice, 60 Minutes, and All in the Family come on. I have always contested that every true Star Wars fan should have to sit through this thing at least once. So this is my public service offering to you. Merry Christmas and have a Happy Life Day!